Following large seizures of pangolin scales amounting to 10 tonnes in Vietnam, Hong Kong, and Uganda over the past two weeks, authorities in Malaysia have announced the discovery of two major pangolin processing facilities stocked with thousands of boxes of pangolin meat in the state of Sabah. It marks the largest seizure of pangolin scales in Malaysia to date. Working on a tip, police from the Sabah state capital of Kota Kinabalu and a team from the Sabah Wildlife Department first raided a factory in the city on February 7th, and later a warehouse in Tamparuli, some 35 km away from Kota Kinabalu. From these two locations, as per a statement from TRAFFIC, authorities uncovered a syndicate dealing in more than 30 tons of pangolins. 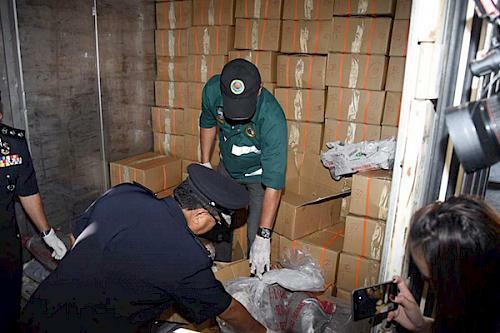 The haul included about 1,800 boxes full of frozen pangolins stuffed inside three refrigerated containers, 572 more frozen pangolins in six freezers, 61 live pangolins in cages and in a car boot, and 361kg of pangolin scales. Two bear paws and the carcasses of four flying fox were also sadly recovered. Alongside the wildlife, enforcers found weighing, sealing and vacuum packing equipment, as well as digital scales, thousands of unused plastic packaging and cardboard cartons which point to a well-established pangolin processing business. A 35-year-old local man, believed to be the manager of the factory in Kota Kinabalu, was also apprehended by Sabah police. As per a statement the department sent to TRAFFIC, the Kota Kinabalu factory has been in operation for the last seven years and the suspect had bought all the pangolins from local illegal hunters for distribution locally, and from the neighboring state of Sarawak. Thursday’s seizures came exactly one decade after the discovery of logbooks in a warehouse once used by another pangolin trafficking ring. Those logbooks discovered by the Sabah Wildlife Department in February 2009 were the first to hint at Sabah’s critical role in the sourcing and trafficking of the critically endangered mammal. An analysis of the logbooks by TRAFFIC, after they were generously provided by the SWD, revealed that about 22,200 pangolins were killed, and 834.4 kg of pangolin scales were sourced throughout the state and supplied to the syndicate during a 13-month period between May 2007 and January 2009. Despite occasional seizures of live and processed pangolins since then, including a find of five tonnes of frozen pangolin in Sabah waters in December 2011 by the Sabah Customs Marine Division, recent attention has largely been focused on Sabah emerging as a transit point in the global trafficking of pangolin scales from Africa to Asia. 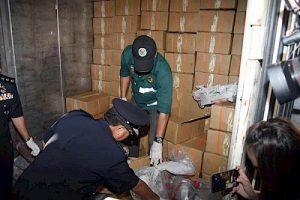 This has arisen from a string of massive seizures of African pangolin scale shipments in Sabah’s Sepanggar Port and at the Kuala Lumpur International Airport’s Mail and Courier Center originating from the state in 2017. A local businessman is facing trial in the Sabah courts stemming from one of these cases. Including this case, Sabah has been implicated in over 40 tons of pangolin smuggling since August 2017, including 13 tons of African pangolin scales. Thursday’s discovery of the processing facilities draws attention back to local poaching, demand and illegal trade in pangolins, as well as the persistent threat to the Critically Endangered Sunda Pangolin, Malaysia’s only native pangolin species. Sabah, which has its own wildlife legislation, upgraded the species to a protected species in 2016, conferring it to the highest level of protection under the law. A conviction for illegal possession of a totally protected species invites a minimum fine of MYR50,000 (USD12,500) and up to MYR250,000 (USD60,000) as well as a minimum of one to five years imprisonment. World Pangolin Day, established to raise awareness to the world’s most heavily trafficked mammal, falls on February 16th of this year. Previous TRAFFIC studies in collaboration with the Adelaide University have shown that at least 20 tonnes of pangolins and their parts are trafficked internationally every year, through an average of 27 new routes annually. The post Breaking! Malaysia Announces Massive Seizure Of More Than 30 Tonnes Of Pangolin Scales Including 61 Live Animals appeared first on World Animal News.